Apostille Stamp | Notary & Apostille Service, Inc. The Secretary of State in most cases is the only authority autorized to issued the Apostille or Certification Letter. Notary & Apostille Service. Inc. takes the trouble of getting this time consuming process done. We know the rules that apply to each type of document and can expedite the process through the various government offices for you. If you have a New York City Death Certificate or a New York State Death Certificate & you are trying to get an New York State Secretary of State Apostille on your Death Certificate and everyone is telling you, that you need the Letter of Exemplification to get an Apostille; don’t worry because Notary & Apostille Service can get an Apostille on your Death Certificate without the Letter of Exemplification. Then why is it that everyone is telling me that I need a long form Death Certificate and this Letter of Exemplification? Many Apostille services tell you this because this is what the Office of the New York State Secretary of State is telling everyone and this is what The Manhattan County Clerks Office is telling everyone who comes in without the Letter of Exemplification. I not saying that they are incorrect, I’m just saying in New York City, that is the normal procedure to follow. New York State has 62 county clerks’ offices and 5 of them are located within New York City & they all run a very differently. Notary & Apostille Service will take that extra step, for our customers, to any of the other County Clerks’ Office to get your Death Certificate verified & Authenticated so you can get an Apostille without having the Letter of Exemplification. Therefore, it does not matter if you have the short form Death certificate or the long form Death certificate if the City Registrar on your Death Certificate is any of the followings we can help you get your Apostille without the letter of exemplification. 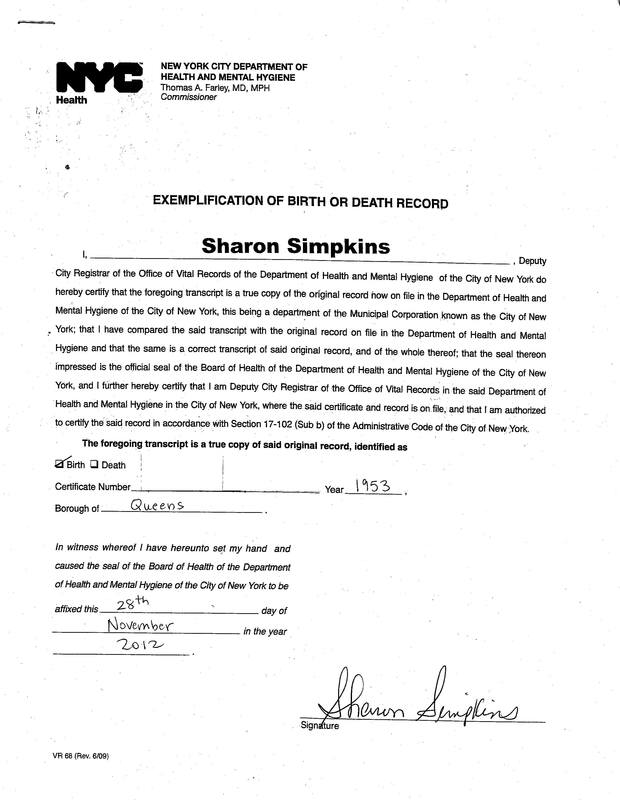 Even if the City Registrar name is not listed just send us a scanned copy of your Death Certificate so we can verify if it can be Authenticated & Apostille. To get your New York City Death Certificate Apostille without the Letter of Exemplification go to Notary & Apostille Service click on “Contact US” then click on the “Getting Started” link. Same Day RUSH service is available. How to get an instant Statewide Criminal Background (History) Record Search without having to submit fingerprints? Many time you’re completed all of the paper work required for you to get married, get a job oveseas or go to school in a foreign country and you find out that you need a background check. So now you’re in a rush to find a service that will get a Criminal Background Check done for you without the hassle of going to your local police department for them to fingerprint you, only to be told you need to bring them a fingerprint card, FD-258 or some other type of information is required that you don’t have. Notary & Apostille Service, Inc. can now assist you in getting a Criminal Background Record Check “Instantly” without having to submit any fingerprints. All we need is some basic information like your First & Last Name, & your date of birth. We will then submit this information to the direct search access to the New York State Court record system, so we can provide you with instant access to any criminal court record history that is on file. If you are going to use this information in a foreign country you will more than likely need to have an Apostille or a Certification for this background check depending on what country you plan on using Criminal Background Record Check in. You do not have to be a resident of NY State in order to get this background check. How do you get started with your Criminal Background Record Check or a Criminal Background Record Check for your employees? Click on this Criminal History Record Search link, this link will take you to Notary & Apostille Service, Inc website, then select the “Criminal Background Record Check Order Form“. Fill out that form with the information requested, then submitted via any communication channel available to you, (e.g. email, postal mail, fax, etc). Background checks are instant, however, Apostille according to the Hague Convention & Certification, Legalization service is a little longer since a certification letter must be picked up from the provider of the Criminal Background Record data. Notary & Apostille Service, Inc. is a private for profit company registered in the state of New York. We are not related to any governmental agency. We do not issue or sell documents. We are not lawyers and we do not provide legal advice, tax advice or any other legal or professional advice of any kind. South Africa is a member of the Hague Conference & they also subscribe through Accession to the ‘Convention of 5 October 1961 Abolishing the Requirement of Legalisation for Foreign Public Documents’. What does this means to you? It means that you now can now apply for an Apostille through the New York Department of State Office of the NYS Secretary of State to have your documents legalized for use in South Africa. There are many other countries similar to South Africa that accept the NYS Secretary of State Apostille as an acceptable document for international legalization. So, there is no need to visit the South Africa Embassy or consular office for Certification or a legalization stamp. If you need an fast, affordable New York Department of State Apostille Service for South Africa, you can call or visit Notary & Apostille Service. To get started on an USA Apostille for South Africa and for detailed instruction on how we can assist you in getting a Secretary of State New York Apostille for your document click on Notary & Apostille Service.